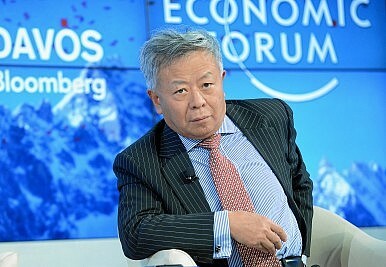 Jin Liqun, president of the AIIB, at the 2013 World Economic Forum in Davos, Switzerland. Is the AIIB Really 'Lean, Clean, and Green'? AIIB’s “lean, clean, and green” pledge delivers a catchy slogan, but here is why some are unconvinced. Those attending the Asian Infrastructure Investment Bank Annual Meeting in June will have no doubt heard the words “lean, clean, and green” in quick succession. The Bank’s pledge on climate change has delivered a slogan that AIIB executives have quickly adopted into their everyday vocabulary. But underneath this emboldened rhetoric is incremental progress, not decisive action. The choices that Asian countries make about their energy infrastructure will fundamentally affect the planet’s ability to keep global temperature changes below 2 degrees Celsius. That is why it is so important that AIIB’s President Jin Liqun announced that the Bank has no plans to fund coal projects in the pipeline and reiterated the Bank’s commitment to the Paris Agreement. In a time when the United States has announced its withdrawal from the Paris Agreement, this leadership in itself is something to celebrate. Why, then, are many unconvinced about AIIB’s commitment to tackle climate change? There are essentially two reasons. First, the Bank’s new energy strategy still leaves the door open for coal. It states that “[c]arbon efficient oil and coal-fired power plants would be considered” in specific conditions. This harks back to what many other multinational development banks have been doing: avoiding coal projects in the immediate term, but leaving the door open for a return to coal “in rare circumstances” (although “rare circumstances” is being defined in different ways). Second, the renewable projects taking the place of coal power are land intensive and often cause serious problems for surrounding communities. Little has been said about how these risks will be mitigated. Out of the ten energy projects currently disclosed as approved or proposed by the AIIB, three involve large hydropower projects (another three involve natural gas and only one is solar). Mega dam projects have historically faced strong opposition in many parts of the world for their devastating social and environmental impacts, usually involving unjust resettlement and loss of livelihoods of communities. For instance, the Tarbela 5 (T5) hydropower extension project in Pakistan is one of the first investments made by the AIIB. The World Commission on Dams had documented the displacement of tens of thousands of people in the 1970s and 1990s for the original dam, back when the World Bank was the only main investor. To this day, many families continue seeking for fair compensation and redress for their losses. As the AIIB steps in as a co-financier of the extension of the hydropower site, more people are set to be displaced. However, according to the Bank Information Center, “Local communities have not been adequately informed or involved in public consultations held for T5, and many have not had heard, especially women. Nor are project documents readily available in a manner accessible to local communities, despite promises to the contrary, and requirements in both World Bank and AIIB standards.” The Business & Human Rights Resource Centre’s newsletter on Chinese responsible investment overseas features reports on social and environmental concerns related to another five out of the 13 projects approved by AIIB at the time. Besides concerns about its investments, gaps remain in the bank’s policies and safeguards, affecting its ability to prevent potential negative impacts. An example is the bank’s Environmental and Social Framework (ESF), which requires AIIB to undertake free, prior, and informed consultation (FPICon) rather than obtain free, prior, and informed consent (FPIC) of indigenous peoples for the bank-supported projects, unless the latter is required by the local law. The regional organization of indigenous peoples’ movements, Asia Indigenous Peoples Pact, argues that such requirement falls short of existing standards of multilateral financial institutions, including the World Bank and the International Finance Corporation, and the indigenous peoples’ right to FPIC as guaranteed in international human rights instruments. In this sense, the bank has failed to establish itself as a credible multilateral financial institution for indigenous peoples. Despite the shortcomings, there are positive steps to be noted. The AIIB is developing channels to engage with civil society groups and communities. While the efficacy of these platforms and sincerity of their engagements remain to be seen, early signals indicate that the AIIB is following in some of the footsteps of other multilateral development banks in addressing social and environmental issues. Despite these steps, the Bank is still quite far from demonstrating a leadership role in this area, and there is a lot of work to be done by decision makers in the Bank and other stakeholders. Is the AIIB truly “clean and green”? By many indications, not yet, and it is uncertain whether it will ever truly be. But civil society has demonstrated an interest in pushing it to be truer to its own pledge. After the second annual meeting, all eyes are now on the consultation on AIIB’s Complaints Handling Mechanism, a function present in many multilateral development banks that allows people affected by their projects to voice their concerns. The quality of such mechanisms is generally viewed as fundamental in realizing a bank’s social and environmental commitments. It would be crucial for the AIIB to get this Complaints Handling Mechanism right. Lowell Chow is the East Asia Researcher & Representative for the Business & Human Rights Resource Centre. The Bank is also set to expand its membership roster, focusing primarily on Latin American and African states.